The ancient Greek philosopher Socrates famously stated: “The unexamined life is not worth living”, and far from being a ‘soft’ option, Religious Studies is academically rigorous in its ‘examination of life’. At GCSE and ‘A’ Level Religious Studies follows the OCR Philosophy of Religion and Ethics syllabus, and pupils throughout the school are encouraged to explore the ‘big’ philosophical, moral and religious questions of life: www.ocr.org.uk/qualifications/by-subject/religious-studies. Pupils consider responses to these big questions from some of the major world religions, including Christianity, Judaism, Islam, Buddhism, Hinduism and Sikhism, as well as looking at the non-religious responses of Humanism and Atheism. 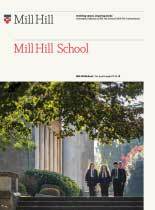 In a post-modern world of bewildering moral complexity and cultural diversity it is important for a pupil’s self-confidence to understand the philosophical, religious and moral foundations which have shaped society, and in turn to be able to articulate their own philosophical, religious and moral belief systems as they leave Mill Hill and take up their place in the world. Religious Studies enables pupils to develop a range of intellectual skills, which are valued by universities and employers for a wide variety of courses and careers, such as: independent thinking; empathy and openness to diverse views; the ability to construct and defend logical arguments; identifying false premises and invalid reasoning; thinking and problem solving; writing skills and clarity of expression. Religious Studies ‘A’ Level can lead to Single Honours degrees in Philosophy or Theology at most major universities including Oxford and Cambridge, or as part of a Joint Honours degree, in combination with a large number of other subjects. ‘A’ Level Religious Studies is recognised by the Russell Group of universities as ‘suitable preparation for entry to university’. UCAS identifies a number of possible careers for Philosophy and Theology graduates, among them: law, education, journalism and the media, social and pastoral care, government, publishing, charity work, personnel, computer and information technology – and in all contexts where precision, clarity and high level abstract planning and analysis are required. It is good preparation for management and leadership roles.